A huge honour for Khulekani Magubane (and Umsinsi Press and Dancing Pencils) is his selection to be part of the illustrious “Time of the Writer” held each year in the Sneddon Theatre. The authors selected to be part of the programme come from the United States, Guinea, Kenya, Liberia, Botswana, Togo, South Africa, Kenya, and India. 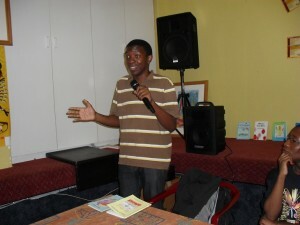 Khulekani has been involved, during this week, in school visits. On Friday evening, he has a slot in the programme and he is also being interviewed by SABC radio on Friday afternoon. In 2011, the programme Mother of all Professions, which is on the SABC channel 1 came to Durban to do a weekend of interviews on Dancing Pencils. Besides filming at the BAT Centre, they went to Umbumbulu to interview and film rural learners whose school achievements had turned around after starting a Dancing Pencils Writing Club in such rural conditions. When Mother of All Professions came to Durban they also asked to interview a writer from the rural areas who had developed substantially, and they wanted to interview his mother as well. I selected Khulekani Magubane from Estcourt whose love of writing has encouraged him to write many book for children, the latest being Racers Rats And Rubbish Bins, published in 2012. Khulekani is now a qualified journalist who graduated after studying at the Durban University of Technology. He is often on television and interviewed in magazines and newspapers. He started his writing career at age of 16, 10 years ago, in the Bubbles Dancing Pencils Writing Club in Estcourt which was mentored by his mother, Stembile Magubane. Stembile recently received a 10 year framed certificate from Dr Zweli Mkhize, the former KZN Premier, for her work as a mentor. She started her Dancing Pencils Writing Club in the township school of Emmashini in Estcourt and now teaches at the prestigious Drakensview Primary school in Estcourt. In her early days of being a mentor, she ran a private writing club and from it, several very talented children wrote stories that were published.